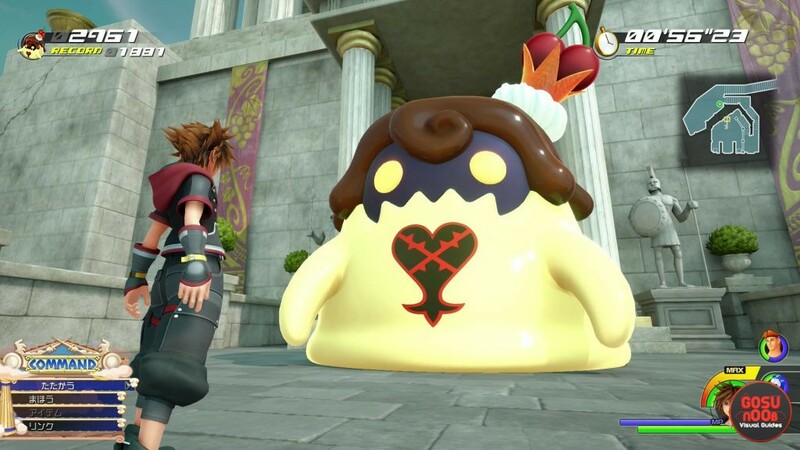 Flantastic Seven in Kingdom Hearts 3 are pudding-like creatures hidden in the largest maps. Every one of the KH3 Flantastic Seven lets you play a minigame. As you might assume, there’s a total of seven puddings in Kingdom Hearts 3; one for each of the major worlds. The Flantastic Seven are hidden; some of them much better than others. They appear as a large crown with a giant piece of fruit on top. Beating the Flantastic Seven minigames grants you some very valuable rewards. With that in mind, our Kingdom Hearts 3 Flantastic Seven Locations & Rewards guide aims to show you where to find all seven pudding minigames, as well as what rewards you get for beating them. Where to Find Flantastic Seven Pudding Games in Kingdom Hearts 3? To find the Flan, or Pudding, or whatever, in Olympus in Kingdom Hearts 3, your first step should be to teleport to the second fast travel point. It’s in Thebes, and the picture shows a bunch of tall columns in the background. From there, turn around, and go up the stairs. Climb all the way up to the entrance into the temple-looking building. The crown with two cherries is pretty hard to miss. Next up, the Flatnastic Seven location in Toy Box. This one is really simple to find. First, teleport to the third fast travel point of the Toy Box world. It’s the one that shows a bunch of seats, and it’ll take you straight into the Galaxy Toys store. Head west from the spawn point, towards the group of three vending machines (one of them dispensing tea), and around the couches. You’ll see a crown with a strawberry on top. Now for the pudding game in the Kingdom of Corona. Travel to The Forest; specifically, to the second fast travel point in this world. From there, head down the path to the southeast. Go to through the canyon, all the way until you reach another large clearing. Head left when you enter the clearing, and you’ll spot the crown with an orange on top. The Monstropolis pudding minigame, or one of the Flantastic Seven, requires a tad bit more work than the previous one. To start, make your way to the Door Vault area. You can do so by going to the third fast travel point, and going through the pinkish door right in front of you. The next step is to go straight forward, and then hang a right. This corridor will lead you to rows upon rows of doors. Go left, and interact with the brownish door in the corner. Once you reach the new area, turn around and look behind you. You’ll find the banana flan crown at the end of a corridor, on a platform. If the previous one was tricky, it has nothing on the Flantastic Seven location in Arendelle. This one proved to be the hardest one for us to find. Okay, so, first go to the fifth fast travel point in Arendelle; the one that shows a picture of Elsa’s ice castle. When you arrive, you’ll see a Moogle Shop on the left of the bridge leading to the castle. Approach the ledge to the left of the little Moogle. Then, just fling yourself off the cliff. You’ll spot a clearing among some pines below. The crown with a blackberry on top is in the upper left corner as you fall. Now, it’s time for the pudding hunt to commence in San Fransokyo. They really put this one out of the beaten path. Alright, so, start the journey from the third San Fransokyo fast travel point. Head left, aka to the northeast. We’re heading for the tall building that’s appearing on the horizon. On the map, it appears like a large square with rounded corners. Clamber up said building until you reach the catwalk / ledge that’s almost at the top. Now, look eastward and down. You’ll see the pudding with some manner of green melon or something on one of the roofs below. Use your dash to reach it. Our next and last target is the Flantastic Seven pudding mini-game in The Caribbean. Luckily for us, this one is arguably the easiest of the flans to find. We’re going to Port Royale; specifically, the sixth fast travel point in The Caribbean world. When you get there, you’ll immediately face a fork in the road. Head right, and you’ll immediately spot the crown with a watermelon on top. The rewards you get for beating the different Flantastic Seven minigames depend on which one you beat. Every one of them grants you a special cooking ingredient that you won’t get anywhere else: the Blood Orange one gives you Blood Oranges, the Cherry gives you Sour Cherries, and so on. If you get a really high score, every one of them will grant you a special ability boost. For example, the Cherry grants you a Formchange Extender, and the Blood Orange grants you the Treasure Magnet ability. Most important of all, though, is the reward you get for completing and getting a new high score on all seven Flantastic Seven games. If you manage to beat them all and get a high score on each one, you’ll get Orichalcum; one of the many materials that you need to craft the Ultima Blade, the most powerful weapon in the game by far. It’s the rarest of materials, so you really want to complete all of these.